Most business mistakes or failed startups can be traced back to wrong or miscommunicated assumptions. I made lots of bad assumptions on my first startup. In the end, sales didn’t grow as fast as I hoped and fixed expenses were much higher than I anticipated. I’ve also seen large corporate programs waste millions of dollars due to bad assumptions or even just a failure to communicate assumptions adequately. Assumptions are so important that some very highly paid business process consultants require Assumptions Trackers as part of the overall business management process. We will combine some Lean Startup methodologies with some excellent work by HBR in a Book Chapter named Mastering Emergent Strategies. The idea behind these two methods is to identify areas of uncertainty in your assumptions, take the scary ones and find the easiest way to test them. I take these concepts, apply a bit of Ordinal Scale math (from Six Sigma) and provide a suggested priority for testing. If you follow the suggested order, you’ll be doing the least amount of work to gain the most return on managing the highly uncertain areas of your project that I can give you. The exercise will have three phases. First is to list your assumptions about a project. Second is to rank and sort those assumptions by confidence, riskiness, and ease of testing. Finally, we test the ones which are the most important and easiest to address quickly (Fail-Fast). First things first, start by listing your assumptions in the first column. Don’t worry about the rest of the columns yet, we’ll get to those. You really need to get to about 50 assumptions before you’ll start to identify a few key assumptions which were unstated, or you didn’t even realize you were making. Your target should be to list at least 100 assumptions. What are your customer wants and needs? How does your product fit into your customer processes? Will customers accept your product’s weaknesses? What is your customer’s willingness to pay? What is your development cost? What is the production cost? How frequently will you have to customize the product for your customers? What kind of profit sharing will you have to do? What kind of cost sharing do your customers expect? 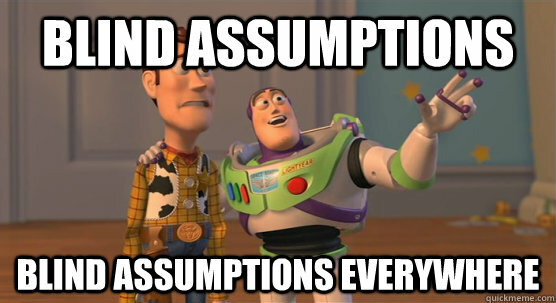 Once you get a critical mass of assumptions you can start to assess your confidence and risk in the assumptions. Confidence options: How much would you bet that your assumptions are right? Risk options: What happens to your strategy if you are wrong? At this point, you’ve probably realized that some of the assumptions you’re making are a big darn deal. Each time I do this exercise I run into about 10 things that I have low confidence in and could cause a Game Over or Strategy Overhaul. Many of these that I hadn’t even thought about yet! Before spending time on what assumption tests you’d like to do, sort the list of assumptions by the Confidence and Risk Score (C&R Score) from worst to best. This should help you focus your time on the scariest assumptions first. Fill in the Test column and an estimate of the Ease of Testing from the drop-downs in that column. Many of the assumptions that I’ve had to test were ones that I didn’t know the answer to, but I know who did know the answer. Many of those tests would be “send an email to my friend the expert” which luckily takes only hours instead of figuring it out myself which takes weeks or years. When you get done looking at what tests you can do for the worst assumptions, you should sort the list according to the Priority Score and start testing. Document your results in the final column so that you can track them. Sometimes the test results aren’t great. This is where the tool was supposed to get you to. You went out and figured out some areas for improvement. The theory is that this means you can pivot now, immediately. Use this new information and get to the final successful result faster and with less wasted time and effort. In some cases, you may find that it’s time to shut down the whole thing. If this tool helped you figure that out sooner, then hallelujah! You didn’t waste more time on it. If this tool helped you figure out an issue before you ran out of money, AWESOME! Feel free to send me shares or donations!